This year I was lucky that the A/B National Road Race Champs were on my doorstep, in Audlem Cheshire. It’s a fast rolling circuit with plenty of opportunities to break it up. In a few previous races on this circuit this year, breaks have gone away and I had missed them, so I arrived at HQ certain that I wanted to get in an early move and build a lead. Worst case scenario for me is getting to the finish in a group, as my sprinting is rubbish. In the race representing Team Chronomaster were Craig, Bambam and myself. In all there were 40 riders, and a few big hitters I wanted to mark. As we rolled out, the summer temperature was rising, and the threat of rain seemed to have gone away. Once we were guided through the finish straight the race was on – 6 laps of the course, just under 11 miles a lap. The riders at the front seemed happy to potter, and so I rolled through to increase the pace. I had a bit of a dig to see who was interested but no-one bit, so I let the bunch catch me. Two riders – Paul Dring and Sheridan Bridal, countered and started to build a gap. 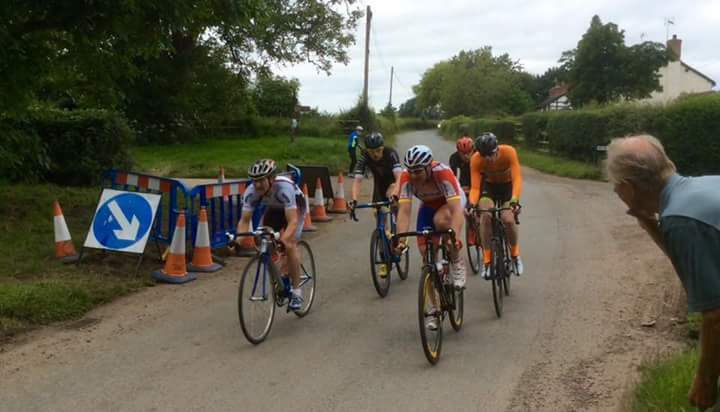 As we approached the hill on the second lap, Mike from CC Luton was very unfortunate to suffer a puncture on the gravelly back roads – race over – and we were down to 5. We were getting very erratic times from the marshals and supporters, ranging from 30 seconds to 2 minutes, so we had no real idea just how big a lead we had. As it turned out, it was growing quickly and both Craig Battersby and John Bamford were working hard to ensure we stayed away, but with so much doubt we set a pretty high pace. We continued to work together for the next few laps, and towards the end of lap 4 – when we were getting more consistent timings (around 3 mins), we decided to steady the pace. Early indications of fatigue were showing, so the ease off was welcome, and as we hit lap 5 I got a nod from Chris Quin to try and reduce the field. For me, this was a good idea as I am not a good sprinter, and didn’t relish the thought of a 5-way dash. So on lap 5, on the hill, Chris launched a big attack. Craig from PMR was right on his wheel, and even though I knew it was coming, was wrongly positioned. I had to attack from the back and try to bridge across. Paul and Sheridan followed me, and I gave it everything to get Craigs wheel back. As we hit the main road, I had got back on. Looking behind, Paul and Sheridan had lost contact and were a couple hundred yards behind. Craig hit the front and continued the acceleration and I followed. For the next 1/2 lap, we continued to put really hard efforts in on the front, and once the other two were out of sight, we settled back to a rhythm again. At this point I was really starting to suffer – I was out of water, and started to feel cramping in my legs. I started to miss the odd turn to try and recover. My biggest concern now was that Chris would attack again – maybe on the finish straight, maybe on the hill. But as we rolled across the line to the sound of the bell, no-one attacked. Ditto on the hill, we stayed together. This made me think that we were all suffering a bit, and that we would settle the podium places in the last few yards. As we approached the final left turn – disaster! – I dropped my chain! As I was wrestling it back onto the chainring, I felt a push from Chris to keep me rolling. For this, I was eternally grateful – thanks mate! As we approached the climb to the finish, Chris was on the front, I was second wheel and Craig was at the back. Chris start to accelerate gradually, waiting for the jump. My plan was to stay on Chris’s wheel and try to take the honours in the last second, but, out of nowhere came Craig. He flew past us both with an immense attack, and took the chequered flag by a clear bike length from Chris, who rolled in second place. I finished in third, still on Chris’s wheel. As we congratulated each other, we saw Paul and Sheridan sprinting for the line, still together. It was great to see they had stayed clear of the rest of the race, for a well deserved 4th and 5th placing. Unfortunately my team mates results weren’t recorded, but John Bamford put in a great late on attack to finish inside the top 10. Craig rolled in with what remained of the bunch, a minute later. To finish, I’d like to thank the race organisers for putting on a fantastic event that ran like clockwork. Thanks to the marshals and to the motorcycle outriders for keep us all safe on the roads and junctions. Finally, thanks to the supporters and helpers back at HQ for looking after us all and plying us with coffee and cake to help us recover. I’m really looking forward to next year, and hope it’s another local race for me!! This entry was posted in Blogs, Results and Reports, Uncategorized. Bookmark the permalink.